Another traditional Malay Wedding dish. 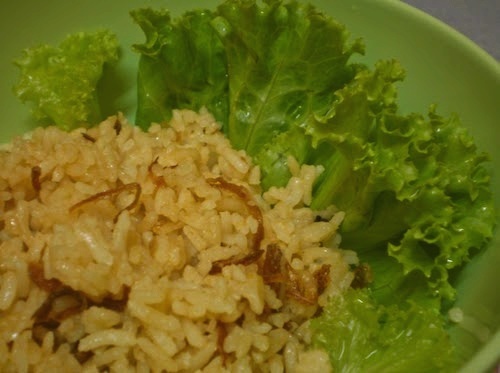 Nasi ( Rice ) Minyak ( Ghee ) is an extremely common and famous dish among the Malays here. It is a key dish in Malay weddings but of course it can be eaten anytime too, no special occasions needed for it. Usually it’s just Nasi Minyak but the recipe is with a twist, adding some lemon grass into it and bringing the taste out more. It is quite a heavy dish as it made of ghee and milk, along with other ingredients. This dish is usually eaten together either with Ayam Masak Merah ( Chicken with Chilies ), Kari Ayam/Daging/Kambing ( Chicken/Beef/Mutton Curry ), Ayam/Daging/Kambing Panggang ( Roast Chicken/Beef/Mutton ) and Acar. The rich combination of the dishes is perfect for celebrations. Rince the rice at least twice and soak it in 1 1/2 cup water for at least 10 minutes. Mince the shallots, garlic and ginger into a paste. Add in lemongrass, screwpine leaf and the spices to the pot for the aroma. Add the shallots, garlic and ginger paste and fry till fragrant. Pour in the milk and water to the pot. Add in Basmathi rice. Add the raisins and nuts. Stir. Add salt to taste. Transfer it into a microwaveable bowl and cook for around 15 minutes. You can also continue cooking it on the stove but it will probably take a longer time and you have to stir it often to make sure it doesn’t burn. Garnish with fried shallots. (You can make your own by shallow frying thinly sliced shallots ’till golden.